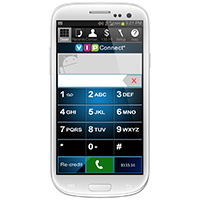 Make really cheap international calls directly from your Android phone by simply downloading the VIPConnect® app for Android now! VIPConnect offers you the best Android app for international calls using your smartphone. In just a few minutes you can easily download VIP Connect, our free international calling app for Android, and begin taking advantage of incredible international rates, special promotions and referral offers from VIP. Stay in touch with your friends and family overseas by calling them directly from your Android smartphone using your contact list. You’ll save up to 90% on international calls, experience amazing call clarity, and benefit from excellent customer support with VIPConnect, the best Android app for international calls. When you download VIPConnect to your Android, international calls become incredibly easy and unbelievably inexpensive. We’re so confident that you’re going to love using the VIPConnect international calling app for Android, that you can even make your first call for free. Simply download the Android app, quickly set up your account, and your first five minutes are completely free. Use your contact list to call any one of your friends or family members abroad. After making your first call, you’ll continue to benefit from competitively low rates that beat out other international call apps for Android phones. Then anytime you want to make a call, simply open VIPConnect on your Android device and dial the number—it’s as easy as any other call. Select the person you’d like to speak to, and, if you’re dialing internationally, the call will be seamlessly routed via your VIP account. With VIPConnect and Android, international calls can become part of your daily routine as you take advantage of our low rates and frequent promotions. Whether you’re calling from the U.S. to countries across Africa or elsewhere internationally, we bring you the best rates possible. You’ll have access to frequent promotions for specific countries, and special offers and Facebook contests. And when you refer friends and family to VIP, you’ll save even more on cheap international calls on Android by earning credit for free international calls. For 20 years VIP Communications has proudly offered the most competitive international call rates and superior customer service. And now with our new VIPConnect app for Android, international calls are even easier for our customers to make. Not only will you benefit from great rates and excellent call clarity, but also from our amazing customer service. We offer you live support should any issues or questions arise, just contact us at any time. Check out our amazing rates on calls from the United States to countries all over the world, and then get started by installing VIPConnect, our international calling app for Android. We constantly strive to bring you the best rates and customer service, so you can stay in touch with the people who matter most to you. VIPConnect is the best android calling app for international calls—sign-up today and receive 5 free minutes!